I usually don’t make breakfast a treat, but once in a blue moon I will. This was deeeee-licious! I had to stop myself from eating the whole pan. I never thought our family would fly through an entire 13×9 pan of something, but we did. And it’s all good. This is like if bread pudding and a caramel apple had a baby. Instead of apples, feel free to use pears, peaches or whatever you like. If you want to use berries, put them on top 10 minutes before it finishes baking. And prepare this the night before!! **Update** The leftovers sat in the fridge a couple of days and they were awesome cold out of the fridge. Yummmmmm. 1. In medium saucepan, combine the brown sugar, butter and water. Boil. Bring immediately down to a simmer on low. Stir for 10 minutes almost constantly, so the sugar doesn’t burn. 2. Take a 9×13 pan or 2 – 9″ round cake pans and cover them with cooking spray or non-stick foil. I like the foil – easier to clean. 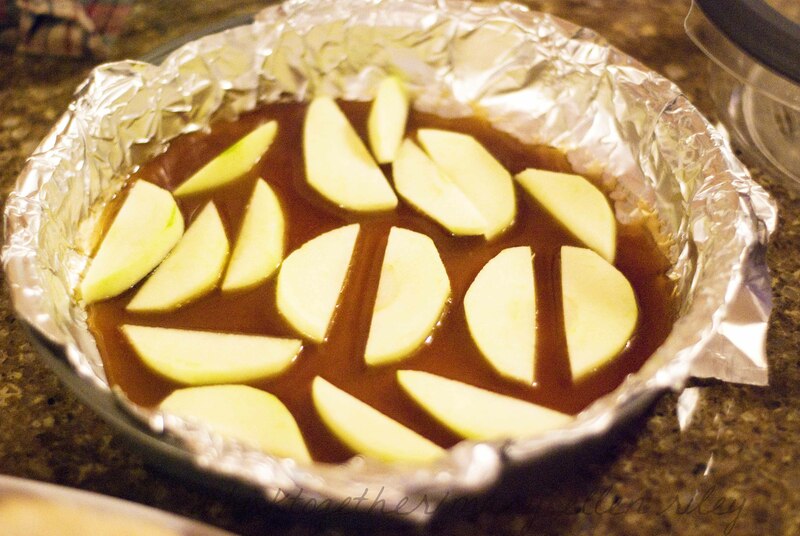 Pour the caramel from the pot into the bottom of your baking dish. 3. Lay the apples (or peaches, pears, etc.) on top of the caramel. Sprinkle some nuts on top if you like. 4. Lay the bread on top. 5. In a medium bowl, whisk together 4 eggs and vanilla. Pour that on the bread. Then take 1 more egg and whisk that with the milk. 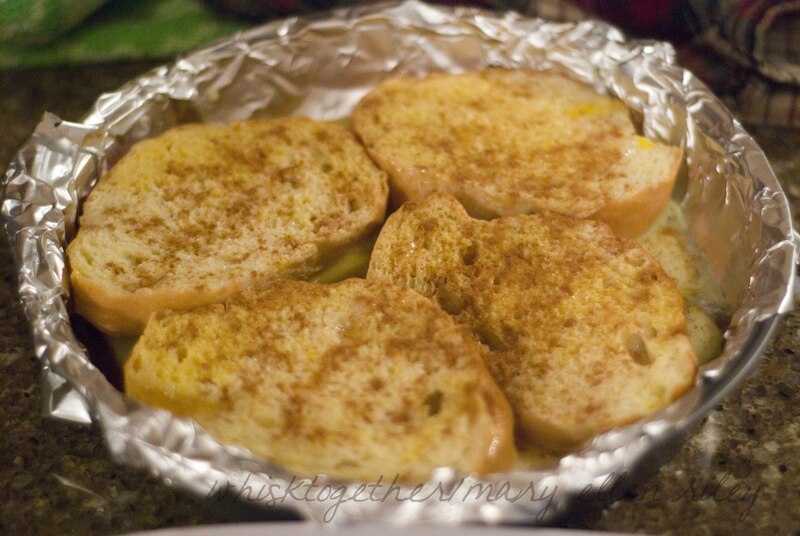 Take the bread and dip it on both sides into the egg/milk mixture and lay it back into the pan. 7. Take the dish out of the fridge and wait 15 minutes. Turn on your oven and wait for it to preheat oven to 350 degrees for 15 more minutes. 8. Bake 15-20 minutes for 9″ round pans or 25-30 minutes for 9×13 pan. ** I know this part is really weird, but this is what worked when I experimented with the french toast. I don’t like it really soggy in the morning. This made it just perfect. I have followed many other baked french toast recipes that use the following formula and it is always soggy. If you like your French Toast a little on the soggy side, simply mix the 5 eggs with 1 and 1/2 cups of milk and the vanilla. Pour all that over the bread making sure it is all covered and bake like usual. 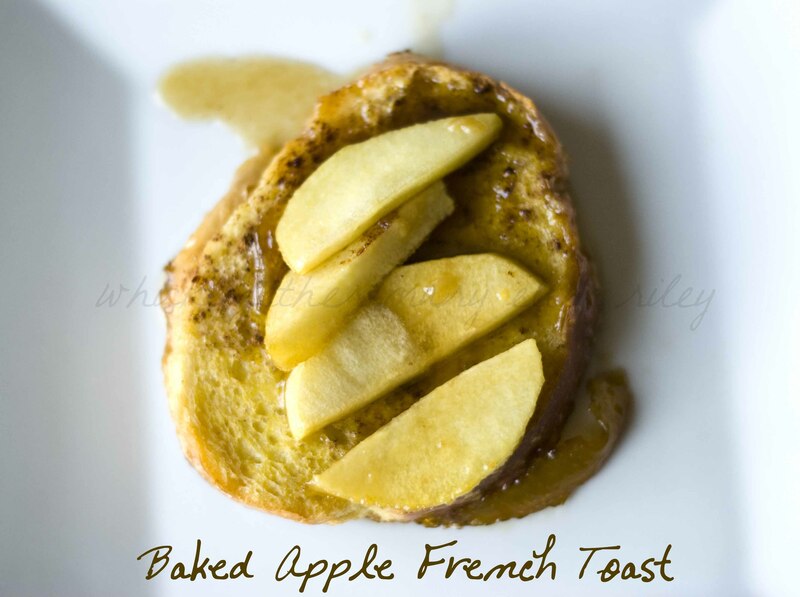 oh that sounds better than any french toast I have ever had!